Recently there has been an upsurge in dizzy treatment devices -- which the author of this page considers to be placebos. Periodically there are reviews made of bizzare devices for dizziness, such as Nick Torok's classic paper "old and new in Meniere's". (Torok 1997; Ruckenstein, 1991). These make entertaining reading. As one man's placebo may be another's panacea, this is of course a matter of opinion and sometimes ends up generating some rather unfriendly emails. Nevertheless, we diffidently offer our opinions here. 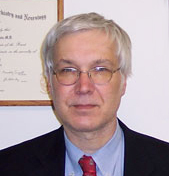 The author (Dr. Hain), is an emeritus professor at Northwestern University in Chicago, and has been involved with vestibular testing and treatment for more than 30 years. "Brainport" or "TDU" -- a substitution device for vestibular problems involving electrical stimulation of the tongue. This is a bizzare device funded by the US government (the National Institutes of Health) who provided a very large sum to the University of Wisconsin. This device was even featured on the front page of a prominent national magazine (The National Inquirer would seem to us to be the proper forum), and even has somewhat of a cult following (see Doidge, 2006). The claims made for this device -- permanent changes to the brain as a result of a brief use of a sensory substitution device -- are just outrageous. What were the reviewers of this grant thinking ? Fortunately, in our view, this device is no longer being sold. We spoke too soon ! There is a new "iteration" of the TDU device called the "PoNS" device, from Canada. Canada already does a brisk business in selling outrageously overpriced generic drugs to the US -- it appears that the Canadians may be branching out into placebos. We wonder if our Canadian friends need a stronger regulatory presence. Meniere's "pacemaker". As the inner ear is not a heart and there is nothing to "pace" in Meniere's disease, it is easy to see the lack of common sense here. See commentary about this as well as other exotic treatments for Meniere's disease on the menieres_placebo page. This is another device funded by the US government. Meniett device -- an aquarium pump like device for Meniere's disease. (Gates et al, 2002). See the menieres_placebo page for more commentary. The study claiming very substantial benefits for this device was funded by the equipment manufacturor, Medtronics. Italian "electric shoe" -- in this odd device, the makers provide an unsteady walking surface for patients with imbalance, suggesting that this will improve balance. Need we say more. Electrical stimulation of ears -- in 2014, Japanese researchers suggested that balance could be improved by "noisy" electrical stimulation to the inner ear. Electrodes are hooked up between the two ears and roughly 1 milli-amp of current (a small amount) was applied using "white noise". For each subject, "optimal trials" (i.e. best trial out of an assortment) were reported. One wonders how one would placebo control a painful device like this. This study is dubious (reviewers for the journal Neurology -- what were you thinking ?). While innovation is certainly valued, this needs to be balanced by common sense and integrity. Gates, G. A. and J. D. Green, Jr. (2002). "Intermittent pressure therapy of intractable Meniere's disease using the Meniett device: a preliminary report." Laryngoscope 112(8 Pt 1): 1489-1493. Torok, N. (1977). "Old and new in Meniere disease." Laryngoscope 87(11): 1870-1877.